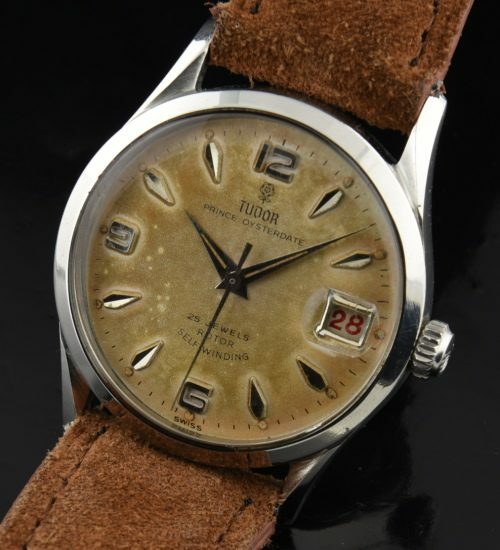 I absolutely love the original dial on this vintage TUDOR dating to 1959! This dial has amazingly aged-taking on the look of suede. Notice the original Dauphine hands with original luminous. These exaggerated raised steel Arabic (EXPLORER) style numerals and arrow markers really sets off the look. This watch goes further and offers an original and uncommon roulette date feature (changing from red to black). The original ROLEX OYSTER 33mm. stainless steel case is also special; being that it has the inwardly curved bombè lugs. The automatic winding TUDOR movement was cleaned and is accurately keeping time. These vintage TUDOR OYSTER watches are currently overlooked and undervalued in my opinion.